YR – CLASS – G – IP – W-L – ERA – BB – K.
2009 – SO – 16 – 104.2 – 9-2 – 3.27 – 55- 136. Fastball: Wimmers throws a 2 seem fastball that sits in the low 90s and he maintains his velocity late in games. Like many college pitchers, he throws a great majority of his fastballs on the outer half of the plate, rarely challenging hitters inside. The pitch bores slightly towards right handed hitters but straightens out when he overthrows. Wimmers threw 44.3% fastballs against Indiana. Curveball: Wimmers possesses one of the better curveballs in the 2010 draft and he knows it. He’ll throw it in any count with confidence. Sometimes he’ll throw a get me over curve up in the zone when he’s behind in the count and other times he’ll throw it in the dirt as a strike out pitch trusting his catcher and long time battery mate (dating back to High School) Dan Burkhart to be a wall. Wimmers threw 28.3% curveballs on the Indiana contest and generated a swing and miss 23% of the time when thrown. Changeup: This was Wimmers most interesting offering to me. He has good arm action and the pitch, while lacking much lateral movement, has late break. The changeup is not as advanced as his curveball, however it’s a pitch he rarely used or needed as a sophomore yet now it’s a slightly above average pitch and he goes to it fairly liberally. Indiana started 5 left handed hitters, so it’s possible these numbers are skewed, but Wimmers threw 27.3% changeups against them. In the 9th inning he threw 4 changeups in 5 pitches to Alex Dickerson, Indiana’s best hitter, eventually enticing him to chase one down in the zone for a fly out to centerfield. He generated swings and misses on an impressive 31% of his changeups thrown. Wimmers isn’t exactly a max effort delivery guy but he’s close. 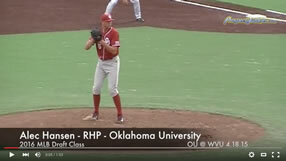 Listed at 6’2, 215, he looks much smaller on the mound and puts a lot of that slight frame behind each offering. His follow through has him falling off to the 1st base side and which negates his natural athleticism when fielding his position and it may be an attributing to him occasionally losing his release point. The positive is that he shows a great apptitude for making in-game mechanical adjustments. Alex Wimmers could go as high as #12 to the Cincinnati Reds but he will likely come off the board in the late 1st or Supplemental round. He struggled in the post-season last year, however he did prove he could handle elite competition with a great showing in the Cape Cod League last summer. A strong conference tournament and Regional start would go along way with me in determining my final pre-draft ranking. Wimmers has the ceiling of a 3 or 4 pitcher on an average MLB team and his advanced feel for his off-speed pitches is a strong indicator for me that he has an above average probability of reaching that ceiling.